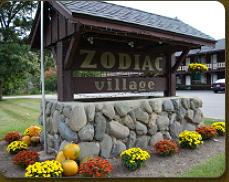 Zodiac Village Apartments offers affordable rental units in Ayer, MA. Located in North Central Massachusetts in the beautiful Nashua River Valley, we are located less than 1 mile to downtown Ayer and its Commuter Rail station, Devens, and Routes 2 & 495. We are also close to Nashua NH, 50 miles from coastal beaches and 35 miles from Boston. We are also minutes to the Rail Trail, for hiking & biking and fishing nearby on the Nissittissit and Squannacook River, Massachusetts' premiere blue ribbon trout stream! If you are interested in finding an affordable, clean apartment in Ayer, MA, choose the units at Zodiac Village Apartments. Our rental and lease options are flexible and perfect for singles and families. We have one and two bedroom units available, with single bedrooms starting at $740/month. Furnished apartments also available. Take a look at our pricing page for more information.